Beyonce Plans to Lose 40 Pounds by the End of March??? Posted on February 29, 2012 by M.E. Beyonce and Jay-Z really love their new baby, Blue Ivy Carter. But what Beyonce does not love, apparently, is her baby weight. Unlike many new moms who may feel uncomfortable with their post-pregnancy shape, Beyonce isn’t content to just join Curves and occasionally skip dessert. Only four hours of exercise and a highly restrictive diet will do. She moved her personal trainer in to live with her. How quickly does Beyonce want to lose 40 pounds? By the end of March. Which is a little less than 3 months after the baby was born. While most parents of infants would relish the ability to sleep past the wee hours of the morning, Lady B is waking up to the face of Marco Borges for the first of two two-hour long workouts, which she undergoes each day. Beyonce is also opting out on any and all comfort food, and existing on protein shakes and ice water. I’m sure she will be back to her regular size or smaller in no time. Especially, since she’s set to start filming “A Star is Born” any day now with Clint Eastwood. Sources close to the ongoing investigation into the death of Whitney Houston tell E! News that her death will be deemed accidental by the L.A. County Coroner’s Office. 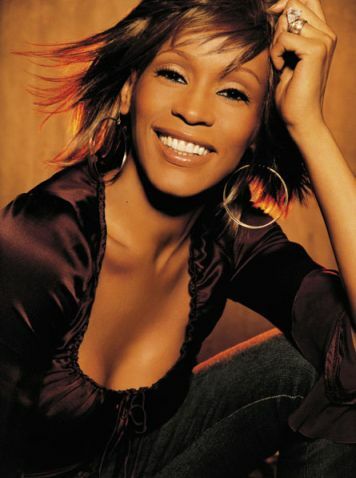 According to the site’s report, the Houston family has always believed that Whitney’s death was a tragic accident. Officially, the cause of death is still listed as “deferred” pending result of toxicology tests. But their source says ”nothing suspicious” has been found and the inquiry is nearing completion. The source also added that ”she had no marks on her body whatsoever to indicate a struggle, and she was the furthest thing from trying to kill herself.” The autopsy tox screen could be sent to Beverly Hills Police Department by next week and, unless their investigation turns up anything else, the case will likely be closed soon afterward. The old Kid Cudi is gone. The G.O.O.D. Music rapper killed off his former self, showing the bloody scars with a gruesome new tattoo. 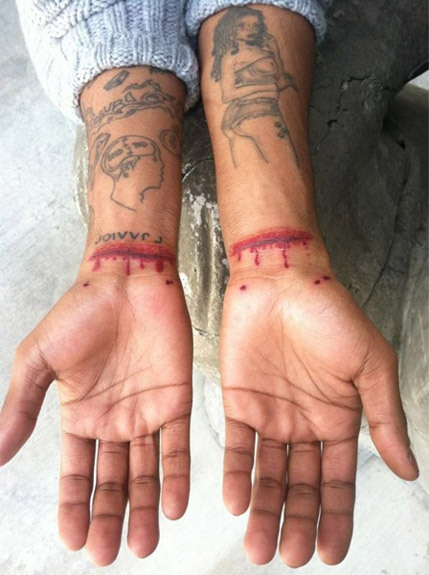 “New Tat The old Scott is dead…slit wrists,” wrote Cudi, who released his WZRD album with Dot Da Genius today. The duo is planning to tour in support of the album and is already working on a follow-up EP. 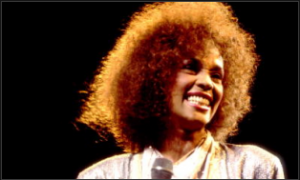 Whitney Houston’s family, spearheaded by her mother, Cissy, is asking law enforcement to look into death scene photos that were leaked to the media in the days after the pop superstar died at the Beverly Hilton Hotel, including one pic of her body being wheeled out on the gurney in a body bag, RadarOnline.com is exclusively reporting. A few days after Whitney passed away on February 11, a media outlet (not RadarOnline.com) published a photo of Houston in a body bag on a gurney being taken out of the hotel. The entire floor was on lockdown, and the area was secured by the Beverly Hills Police Department. There is surveillance video from the hallway of the person who took the picture of Whitney in the body bag, and the Houston family wants to know who it is and have asked for an investigation into the leak of the photos. The Houstons have been told by cops that after her case is officially closed, they can look into the matter. I was so disappointed to see that they released that photo. Some people have no respect for privacy and whoever leaked that photo should be ashamed. To try and make a quick buck off of somebody’s death is totally disgusting!! I know the Enquirer is “a low down dirty dog” type of magazine, but they took it to an all time low. Posted on February 28, 2012 by M.E. There has been a lot of talk about Mary J. Blige’s rendition of the National Anthem or lack thereof at Sunday night’s 2012 All-Star Game. Personally, I think the National Anthem is the true test in whether or not as person can really sing. Yes, Mary J. Blige has a soulful voice and sounds good in her element; however I do not think she fared well with this. 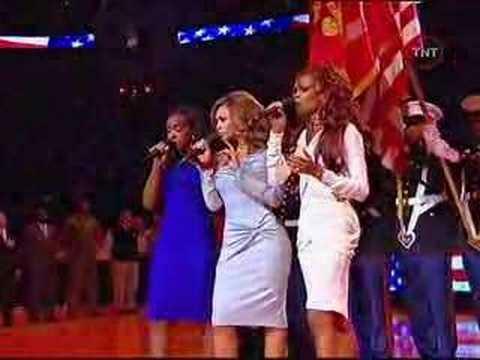 I pulled up an old video of Destiny’s Child killing the National Anthem at the 2006 All-Star game like only they could, incorporating heavenly harmonies, and each member holding their ground (Michelle shines in the clip). I thought this was a refreshing look being as though they have disbanded now, hopefully they will decide to reunite at some point. It’s never too late!! 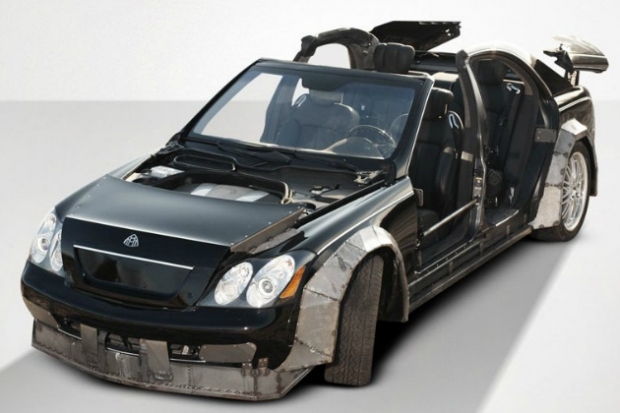 As of this past weekend, fans, passer-bys, and anyone interested in purchasing a piece of Hip-Hop history can view the infamous Maybach used in Jay-Z and Kanye West’s music video for “Otis” off of their Platinum-certified album Watch the Throne. The “customized” 2004 Maybach 57, which is currently up for auction and estimated at a value between $100,000 and $150,000, is residing at 450 Park Avenue in New York City until Wednesday, March 7. The auction will take place on the following evening of March 8. Those interested in seeing the car can stop by the Maybach’s current residence from 10 a.m. to 6 p.m. on Monday thru Saturday and from noon until 6 p.m. on Sunday.